A wastrel with a philandering disposition on the pulpit is worse than a viper. There is a problem in Christendom. Mammon has entered the church, and the devil now wears a priestly garb. Angels aren’t found on earth: it is becoming crystal clear as the flock is led astray by the shepherd rocking to mundane whumps. In the Name of Our Father says it all. A flicker of deja vu, maybe –you have heard of Brother Jero, the archetypal false prophet. But Olukorede brings a new twist to the deceptive motif from the house of hosannas. See how a prophet fights dirty to ensure that a scribbler who has a story to tell about his sullied hands is roped into a foiled military coup, working in concert with the powers that be! 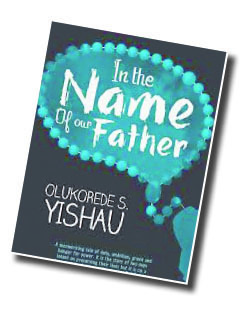 Religiosity and dictatorship are the major themes explored by Olukorede in this debut fiction, needless to say. The story-within-story technique, in the hands of a rookie, can end up as a bagatelle. It is to the credit of Olukorede, however, that he handles it with deftness in the novel. Justus, the protagonist of In the Name of Our Father, is a daredevil journalist who doesn’t compromise; while the antagonist is Prophet Jeremiah of Amazing Grace Chapel. In weaving the tale of disaster, the author utilises the first person narrative technique and the third person. While Justus offers his recollections from the first person point of view that of the randy, greedy prophet is told from a third person perspective. But the author melds the insular territories at the end of the narrative with no room for subterfuge. A web of love with intrigues makes the plot thick. A sly lover man meets a coy mistress, and when the bubble bursts, the randy man is beaten to his game, leaving in the wake gnashing of teeth. The author foreshadows the crisis in the fiction early in the narrative. The threatening letter written by the holier-than-thou prophet to Justus, unveiled in the prologue, reads in parts: “This is the fifth time I am writing to you ….publishing that book is the same as bring (sic) storm into your life…. Mr Journalist, do you know what happened to Dele Giwa? He was blown to pieces for following a path similar to the one you are now on….” (p.6). The section, Harbinger of Storm, tells the story of Angels Live in Heaven, the book being written by Justus on Prophet Jeremiah that lands him into trouble. Unable to bear the vicissitudes of life, Alani runs to Pastor David, a man of God best described as a con man, for help. “I have taken a decision to start a new life,” he tells Pastor David. It is the beginning of a process of initiations into a cult and fortifications to make the former wealthy and a prophet that does many wonders. But there is a price to pay: he has to be sacrificing babies to renew his power. Alani doesn’t want his to be a white garment church; he prefers it to be Pentecostal. It doesn’t take time for the rich and mighty to be trooping into the church for miracles with his newfound power. Alani has now metamorphosed to Prophet Jeremiah. Then, in comes Rebecca Daniels, a city whore, into the life of Prophet Jeremiah. What is meant to be a one-night fling eventually leads to marriage, but it is one plagued with miscarriages. Meanwhile, Pastor Hezekiah, a preacher working with Prophet Jeremiah, can’t take it anymore. The modus operandi of Prophet Jeremiah goes against established norms, so he wants to quit the church. Wary of what his departure portends for the church, his life is cut short by assassins sponsored by Prophet Jeremiah, who also frustrates inquest into his murder, with the collaboration of the powers that be. Politics is introduced to the plot midway with the ensnaring of General Idoti, the dictator ruling Nigeria, who wishes to cling to power perpetually but unsettled by the activities of enemies, mostly human rights organisations. Prophet Jeremiah is also flirting with another sister, Nkechi, and when pregnancy occurs, she accuses the man of God, so he has to rent an apartment elsewhere to hide the shame, also enticed by the prospect of a much-needed baby. The ruse is blown open at the end as Rebecca gets wind of it. A psychiatric hospital beckons for the randy man. The gathering storm sees Justus roped into a foiled coup because of a write-up he wrote in the daily earlier entitled “The Coming Coup”. Freedom only comes his way when General Idoti dies all of a sudden. In the Name of Our Father tells us that not every miracle worker is working for God and not every prophet who preaches in the name of our father is genuine. But there is always a day of reckoning for the evil ones. This work, however, isn’t without as few editorial blemishes.